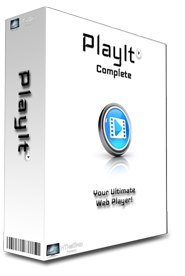 "PlayIt is by far one of the most powerful free plugins I have ever used! This type of design will change the way people adopt client side code..."
Youtube, Vimeo, Blip.tv, Hulu, etc..
All of this and much more!! News and Media Organize all your videos, audio, and web pages into a cleaner organized layout. Healthcare, Technology, and Educational providers can organize all their training data into a single portal. Radio and Podcast bloggers or companies can consolidate all their audio feeds into a more streamlined interface. Professional photographers can use PlayIt to create a portfolio of their images and play any custom slideshows. Any individual or company can use PlayIt to organize all of their media types into a quick, streamlined interface. Please see the PlayIt knowledgebase, with guides, FAQs, videos and other resources. Because PlayIt is a free product we currently do not offer training/setup/migration or one on one help. *Basic configuration is required for setup. Easy step-by-step instructions are provided.